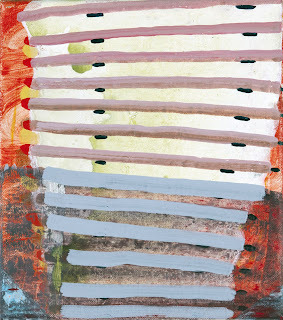 Line pile, 2010, acrylic on canvas, 9 x 8"
My studio is in a highly experimental phase right now. I finished a group of paintings this spring that have consumed my focus for the past two years, so now I find myself in a kind of aftermath of that work—still interested in aspects of what I was doing, but also wanting things to move along. It’s a somewhat uncomfortable place to be as nothing feels quite pinned down or fully articulated, but it’s also an exciting time in the studio. New questions are surfacing. A deep love and interest in collage is re-asserting itself alongside the desire to make paintings. 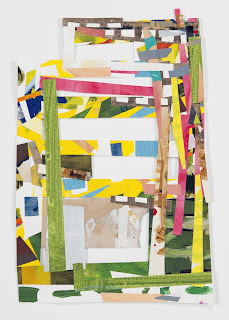 And I am reveling in the amorphous sense of possibility I detect in an investigation into how the innate, particular materiality of collage might condition the innate, particular materiality of painting—and vice versa. I figure by making, so unearthing possibility in the studio means making a lot of nutty things en route to understanding. I’ve got small paintings going that are made out of layers and layers of paint and fabric and paper. I’ve got a wall collage in progress that is gathering size and sense slowly out of accumulated bits of paper. I’m working in my sketchbook a lot—making many small, quick collages that help keep my eye moving. And I’ve been experimenting with paint on various surfaces aside from canvas and paper—my thought is that a lot of these tests will get taken apart and reworked into other paintings eventually. As the mother of a newborn baby and a six-year-old child, I don’t have set working hours. Instead I have to be calmly flexible with when and how I work. So the daily studio routine from my pre-child life has given way to a more cyclical pattern of working a lot during certain seasons, and less during others. I work most during the typical academic school year, as my older son is in school and I’ve got several days a week when I am not teaching at a nearby university. On those glorious studio days, I get to the studio between 8 and 9 and work pretty much straight through until my son gets home at 3. These blocks of studio time are augmented by hours grabbed here and there. But my husband is also an artist, so we work to help the other get into the studio as much as possible. Another habit that supplements studio hours is keeping a sketchbook. I’m nearly always working on small drawings or collages in a sketchbook that I carry around the house—the portability of a sketchbook and its adeptness at keeping my looking fresh and constant make this manner of working a necessity to me. I work in a renovated studio building just off the back porch of my home. My studio was a garage in a former life, as well as a meeting place for a local Boy Scout troop. Since my husband and I bought our house, which is situated on two acres of rural land, we’ve gradually cleaned up the space—whitewashed the whole room, replaced the garage door with a sliding glass door and added sheet rock to some of the bigger wall expanses. This is the second studio space I’ve had that exists on the same property as my house but stands separate from the living space. I like working so close to where my family lives. Practically, having a studio near them is the only way I can consistently get work done amidst the demands of raising children and teaching. But secondly, I draw from my living environment a lot while in the studio. I mentioned the fact that my husband is an artist; his studio is a separate small building just beyond my own. Living with someone who is also engaged in constant dialogue with images, seeing the work he is doing in such close proximity to me, and talking to him about his ideas and images is a real support to me as I work—especially when times are tough in the studio. As I wash my six-year-old son's infant clothes in preparation for the infant son I have yet to meet, I slide back and forth between this present moment of expectation and the first moments of my eldest son's life so long/but so short ago. 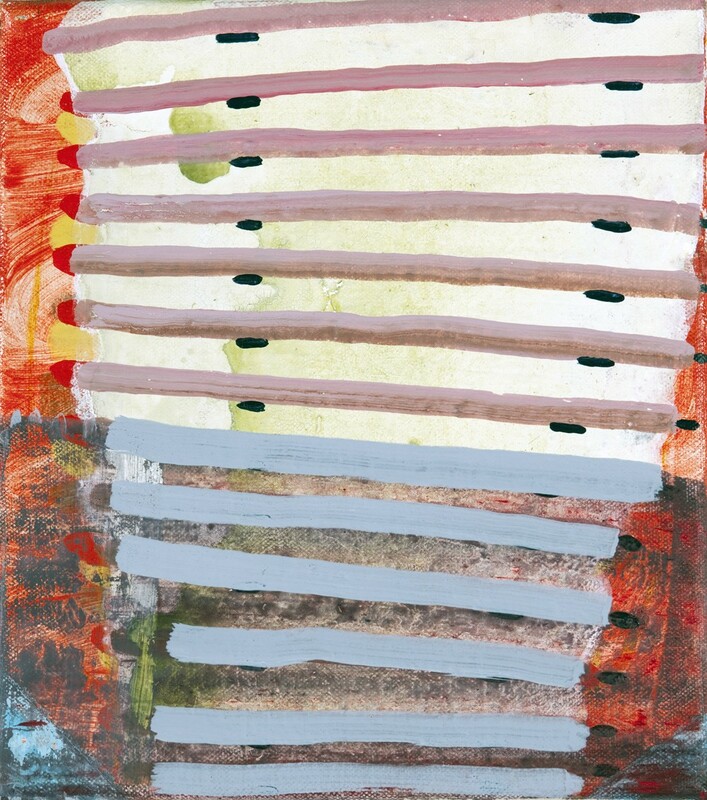 Such a collision of living and remembering yield the sort of snippets of color and pattern and shape and visceral experience I gather in the studio--fragmented panoplies that start and stop, compress and expand into orders all their own. Abstraction is the longed-for underbelly of this life I live and love--the longed-for unseen I try to eke out amidst the adamant/fluid present. All of my work begins with the intrigue of seeing something I’ve never seen before or with seeing something newly. The quality of these kinds of visual experiences is what I take with me into the studio—more so than the actual visual experience itself. So if I am taken by an arrangement of pumpkins and watermelons sitting on our back porch, I care little about the fact that I am looking at pumpkins and watermelons. I’m interested in the strange formal rhythms of their awkward shapes, and the intensity of the orange and green seeming to hover above the grey porch floor. But I’m even more interested in the fact that the “daily-ness” of my life is being impinged upon by this slow moment of unexpected, odd visual delight. In such instances I do feel as though I’m being given a glimpse into another reality—one hidden from me, but existing alongside me nonetheless. I look for a similar experience when I make work. (In fact I think of the studio as a factory for making those experiences visual and physical.) But over time I’ve found I can never just recreate in the studio what I’ve seen out in the world. Something always falls flat in translation. I’ve got to happen upon the experience I seek over the course of working. So I don’t head into working with any hard and fast notions of what I’m going to make. I simply start putting color and shape together and I watch what results very closely. And I tend to work quickly—making lots of visual decisions fast, and working on a lot of paintings and collages at once. Of course my speed means that I get a couple images that hit their mark out of a lot of images that simply don’t, but my failures simply get taken apart and re-used in collages. I really like the notion of a studio as a self-generating space; that is how I think about my own studio. 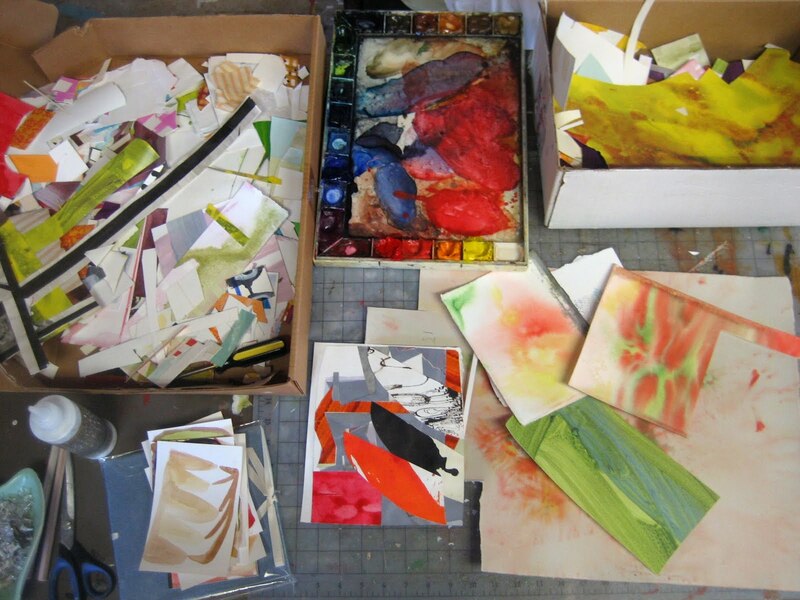 Everything gets used; very few scraps of paper or pieces of canvas or piles of unused paint are ever thrown out. They get stowed in one of many scrap boxes, or stored in glass jars until they find new life (or give new life) to other collages, drawings or paintings. A painting or collage is finished when I feel like it departs from me or can stand alone without me. It has its own momentum. And in the best, though rare case scenario, an image is finished when it feels like it’s just always been, like it was nearly not made by me—it’s a curiosity I can’t stop watching. 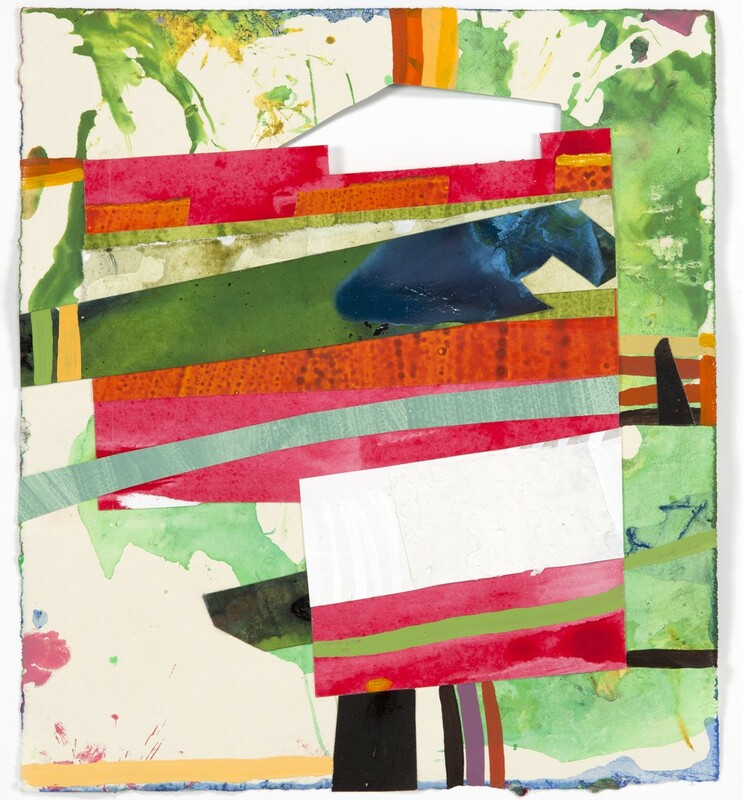 Green maze, 2011, acrylic & collage on paper, 13.5 x 9.25"
It seems that every 5-6 years I hit a wall with painting. I think what happens in these times is that the working definition of painting I carry with me into the studio each day (comprised of how I understand painting materially and how I see painting in relation to life as I grasp it) expires. It’s kind of like I meet up with all the unknown limitations I’ve placed on what painting is, or what it could be and now I have to carve out a whole new space for painting in my world. So I wrestle heartily with the medium for a good long time until I eventually make my way into that whole new space. This is where I am right now. I experiment with different materials when I am trying to shake myself up in the studio, and when I am trying to push myself forward materially or conceptually. I also experiment with different materials when I am lost. Beyond those instances I tend to stick with acrylic paint on canvas and paper-based collages. I like to think that when I am focusing on a material I am working to know the material better or use it in more complicated ways. Some days this is true. 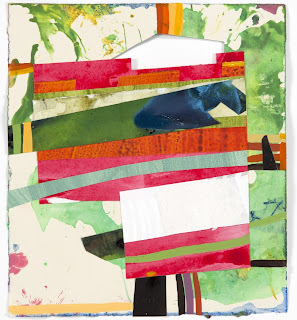 Red & Green, 2011, acrylic & collage on paper, 9 x 8"
I’m not entirely sure. 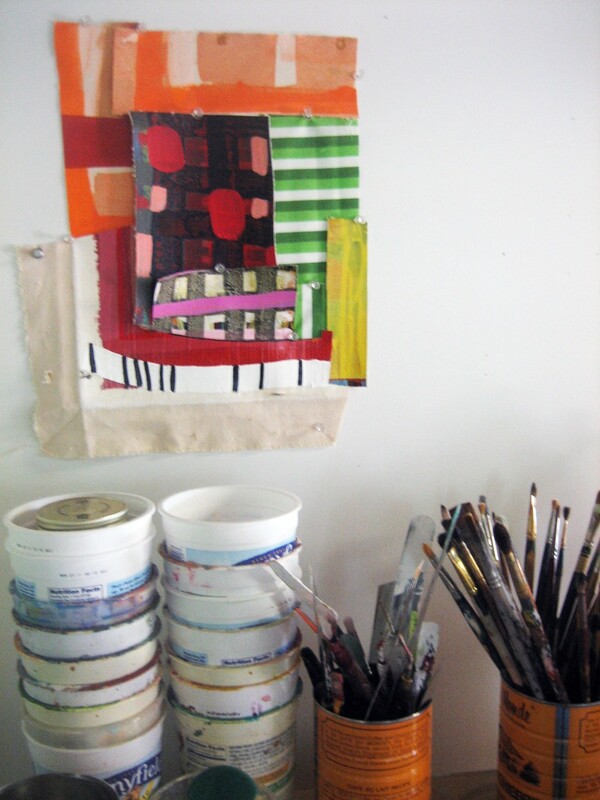 I believe I’ll come to some resolve about my questions concerning painting and collage. 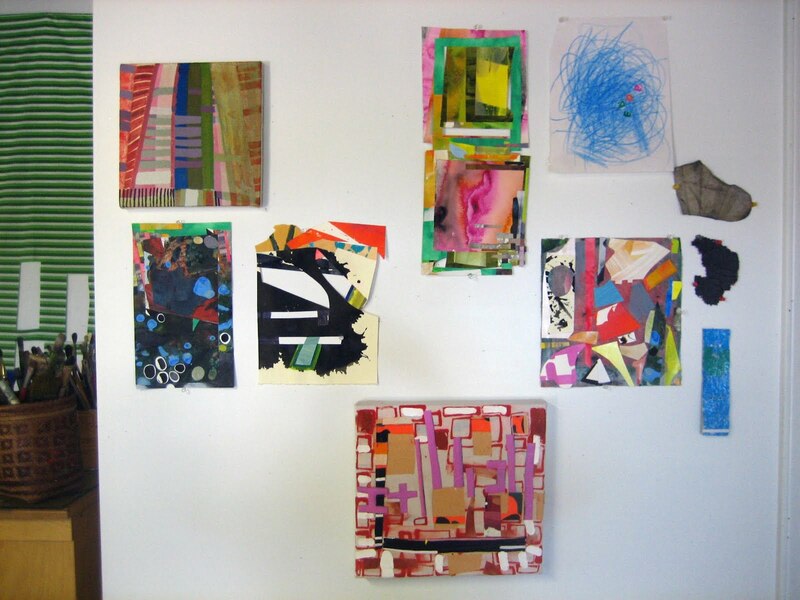 Principally, I think the paintings will get bigger, will probably come off a stretcher, and will meld more fluidly with the medium of collage. And I think some of the more ordered visual structures I’ve been working with will continue to give way to more chaotic, frenetic structures. But I’m also curious to see what the presence of an infant will bring to the studio over the next couple months. My first son’s birth forced changes in working that brought clarity to my approach and to the direction of my work, so hopefully I’m in for the same this time around. The soundtrack-to-my-working on repeat in the studio this summer is the most recent tune-yards album WHO-KILL. Fantastic! "A painting or collage is finished when I feel like it departs from me or can stand alone without me. It has its own momentum. And in the best, though rare case scenario, an image is finished when it feels like it’s just always been, like it was nearly not made by me—it’s a curiosity I can’t stop watching."